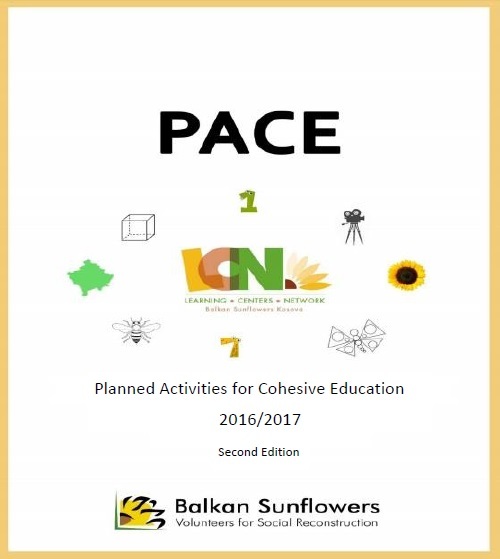 The Planned Activities for Cohesive Education (PACE) program was initiated by Balkan Sunflowers Kosova in their learning centers. This program outline activities to be used with children within the national curriculum to improve their core competencies necessary to succeed in school and life. PACE incorporates science and literacy activities and technology based learning from the Balkan Sunflowers Kosovo"s Reading for Discovery and Learning Through Experiments project. The Second Edition of the PACE curriculum was published in the Fall of 2016, outlining learning outcomes for practical and hands-on activities for children in primary school - Grades 1-6. It incorporates the innovative component of Social-Emotional Learning (SEL) that aims at helping, monitoring and evaluating the social-emotional learning of the children.